Most animals can digest the cellulose in grass because of the anaerobic bacteria called Fibrobacter succinogenes living in their rumen (gut). The bacteria produces the enzyme cellulase and is therefore able to break down the β-Glucans(1,4) glycosidic bond in the cellulose. Animals like cows and giraffes grow up to be very large simply on a diet of grass! Is there a way for humans to ingest the Fibrobacter succinogenes bacteria and be able to digest cellulose? Cellulose-degrading microorganisms involved in the breakdown of plant cell wall material in the human gut remain rather unexplored despite their role in intestinal fermentation. Microcrystalline cellulose-degrading bacteria were previously identified in faeces of methane-excreting individuals, whereas these microorganisms were undetectable in faecal samples from non-methane excretors. This suggested that the structure and activity of the cellulose-degrading community differ in methane- and non-methane-excreting individuals. Note also in Table 1, Fibrobacter succinogenes is one of the strains that seem to have been detected, so that answers the part of your question that seems to ask if humans can incorporate those bacteria into their gut fauna: yes, some already do. 3) according to the paper there isn't much research done into this. 4) the paper gives no info as to how significant those cellulose-digesting bacteria are to the host's energy balance, which I imagine is what you're really interested in. Is it significant, is it too small to be noticeable, does the host even benefit at all calorie-wise? They don't address that question in the paper. In this article it later says: "For example, in the work of Van Soest's group10 11 in which healthy volunteers were fed controlled diets with the addition of cellulose from either cabbage, bran, or a purified cellulose (Solka Floc), average cellulose digestibility was 74% on the control diet, 75% in the cabbage, about 53% in the bran but only 25% from the Solka Floc." 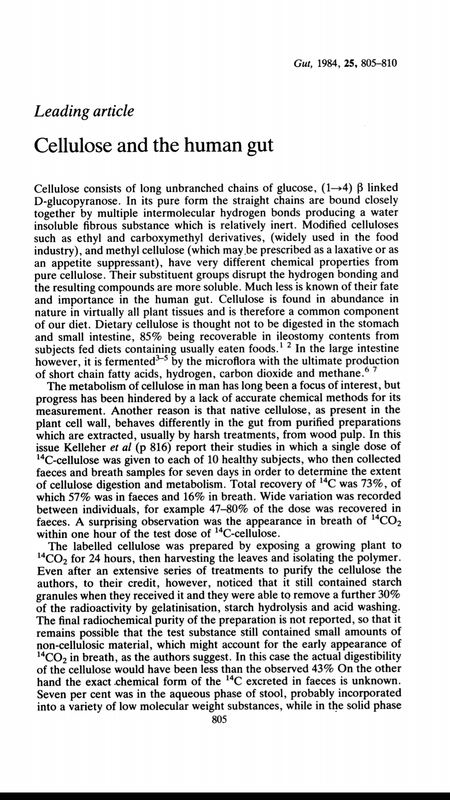 This is to illustrate how naturaly sourced cellulose is way more digestable than a chemicaly isolated one. So the answer is that cellulose found in vegetables is 53%-75% broken down. The article also mentions that it seem to vary between people. The Human digestion system is very much similar to this of primates. In fact, a noticable difference is that the human gut is actually relatively longer. Primates feed on huge amounts of cellulose. It seems obvious that it is energetically beneficial for them. An adult male gorilla will eat up to 30kg of plant matter a day! So yes, without independetly breaking this stuff down, we seem to do fine with a little help from our friends. Their big contribution is not surprising considering the fact that more than 80% of the cells in the human body does not carry his genes (most commonly because it is bacteria, but sometimes because it is fungi). Methane btw, is just one of three common byproducts of the bacteria breaking cellulose down. That is why cattle growing has a severe adverse effect on atmospheric ch4 (extremely potent green house gass). Not the answer you're looking for? Browse other questions tagged biochemistry microbiology food digestion or ask your own question. Digestion Enzymes in Carbohydrate Metabolism?